I often buy a magazine called “MUSIC MAGAZINE”, not every month but sometimes. One thing I like about this magazine is that it introduces us to good music no matter what genre they belong to or whether the musician is famous or not..
Several years ago, I was interested in an article about a singer. While I was reading it, I found the female singer a voice actor for anime. Her name was Hanazawa Kana. 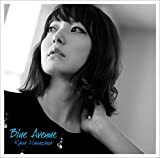 I hadn’t been interested in anime songs before but I was amazed when I listened to the sample songs of her album titled “Blue Avenue” on Amazon Digital Music. The songs in the album were quite different from my own image of anime songs. It was full of jazzy and soulful taste with clear but deep sounds. Hanazawa Kana’s cute voice resounded on that sounds making me feels good. I found that Yakushimaru Etsuko and, for some reason, Swing Out Sisters, their song “Break Out” reminds me old good days, joined in producing the album. Soon I bought to enjoy some songs such as “Nobody Knows”, “Blueberry Night” and so on. I feel they go well with the season coming.